Share these winter tips with employees Talk to employees about things they can do to avoid slips and falls this winter. High heels should not be worn outdoors during winter weather. Flat shoes with slip resistant soles or boots are best. When walking across ice or snow, be sure to take short, flat steps. Walk. Don’t run. Slowing down will decrease the chances of a slip and fall. When entering a building, remember to clean your footwear thoroughly on the floor mats or carpet. Once inside a building, don’t walk too fast and avoid making sharp changes in directions. Report unsafe areas and unsalted parking lots and sidewalks to the appropriate personnel immediately. When getting in and out of vehicles use the vehicle for support. Walk in designated walkways as much as possible. Taking shortcuts over snow piles and other frozen areas can be dangerous. Look ahead when you walk; a snow- or ice-covered sidewalk may require travel along its grassy edge for traction. Maintain Your Car: Check battery, tire tread, and windshield wipers, keep your windows clear, put no-freeze fluid in the washer reservoir, and check your antifreeze. Have On Hand: flashlight, jumper cables, abrasive material (sand, kitty litter, even floor mats), shovel, snow brush and ice scraper, warning devices (like flares) and blankets. For long trips, add food and water, medication and cell phone. Stopped or Stalled? Stay with your car, don’t over exert, put bright markers on antenna or windows and shine dome light, and, if you run your car, clear exhaust pipe and run it just enough to stay warm. Plan Your Route: Allow plenty of time (check the weather and leave early if necessary), be familiar with the maps/ directions, and let others know your route and arrival time. The above is an excerpt adapted from the article, “Safe Winter Driving.” For more information, please visit www.osha.gov. Be proactive. Deal with the hazards. Recognize hazardous conditions and take proper precautions. Remember, sometimes pointing out the obvious is necessary. Entrances and exits. You know they need to be in good condition and that snow, water and ice are hazardous. Instead of trying to shovel and salt all of the entrances, consider closing a couple for the winter. Ask all of your employees to enter and exit from one or two doors. That will make it easier to ensure snow is removed, ice doesn’t build up and conditions are less hazardous. Mop all entrances and exits regularly to prevent water accumulation. Make sure that handrails on stairways and walkways are secure. If someone fell and grabbed the rail, it should be secure. Observe employees’ walking patterns. Consider making walking paths that are highlighted with yard flags or lights. Mark trouble spots with police tape. That way you can ensure the path is properly cared for and employees are using a safe walkway instead of walking through snow banks and over slippery curbs. Remember to adequately salt walkways. The appearance of a clear path may cause people to proceed with less caution. Be sure to remove remelted snow and ice after the application of winter salt. The above is an excerpt adapted from the article, “Slips and Falls: Prevent wintertime falls that impact your work comp costs.” For more information, please visit www.wcfgroup.com. Working with electricity can be dangerous. Engineers, linemen, electricians, and others work with electricity directly, including overhead lines, cable harnesses, and circuit assemblies. Office workers and salespeople work with electricity indirectly and may also be exposed to electrical hazards. One of the common tools utilized following the loss of power are portable generators. 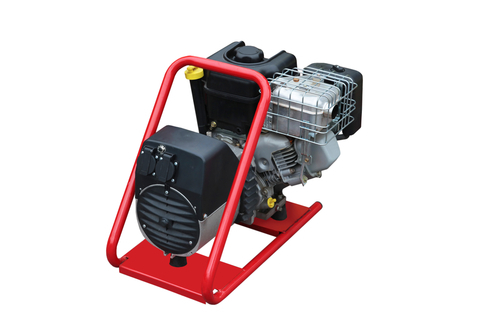 Most generators are gasoline powered and use internal combustion engines to produce electricity. Carbon monoxide is a colorless and odorless gas produced during the operation of gasoline powered generators. When inhaled, the gas reduces your ability to utilize oxygen. Symptoms of carbon monoxide poisoning include headache, nausea and tiredness that can lead to unconsciousness and ultimately prove fatal. • DO NOT bring a generator indoors. Be sure it is located outdoors in a location where the exhaust gases cannot enter a home or building. Good ventilation is the key. • Be sure that the main circuit breaker is OFF and locked out prior to starting any generator. This will prevent inadvertent energization of power lines from back feed electrical energy from generators and help protect utility line workers from possible electrocution. • Turn off generators and let them cool prior to refueling. The above is an excerpt adapted from the article, “Working Safely With Electricity.” For more information, please visit www.osha.gov. If your employee falls and is injured in your parking lot it’s likely the employee is eligible for workers’ compensation benefits—regardless of who’s responsible for snow removal. Employees are eligible for workers’ compensation benefits when an injury occurs in the course of employment. Generally, injuries sustained going to and coming from the workplace are not deemed to have occurred in the course of employment. One exception, however, is the so-called “parking lot rule.” This holds that, if an injury occurs in a parking lot or other off-premises area over which the employer has some control, the injury may be considered work-related and subject to workers’ compensation benefits. It is important to contact your landlord if snow removal is not up to par. Let the landlord know that your employees are in danger of falling due to snow and ice. Be specific about the areas that need to be addressed—the steps near the front door or the sidewalk near the north end of the parking lot, for example. The third party may be liable as well. If your organization leases office space from a property manager or if you employ a third party for snow removal services and your employee fell due to poor maintenance or slippery conditions in the parking lot, you or your insurer may be able to recover some workers’ compensation benefits from the third party. Do what you can to prevent winter slips and falls by thinking outside the box. How Close is Too Close for Portable Generators? National Institute of Standards and Technology (NIST) building experts are seeking the answer to a very important home safety question: How close to a house can you operate a portable gas-powered generator without risking poisoning from carbon monoxide? The above is an excerpt adapted from the article, “Winter Storm Fire Safety Outreach Materials.” For more information, please visit www.usfa.fema.gov. As football fans across the country gear up for Super Bowl XLVII, Mothers Against Drunk Driving (MADD) is urging party-goers to have a plan for how they’ll get home with a sober designated driver… before the festivities get underway. “MADD’s game-day partnership with the NFL encourages fans ‘to play the most important position in the NFL: the designated driver,’” said MADD National President Jan Withers. Super Bowl Sunday continually ranks as the second most dangerous time of the year for drunk driving fatalities, just behind New Year’s Day. According to the National Highway Traffic Safety Administration, 43 percent of all traffic fatalities on Super Bowl Sunday (and the early hours of the following morning) are caused by drunk driving, compared to an average of 31 percent for the year as a whole. “This Sunday is the time to take action and reverse this troubling trend of an uptick in drunk driving after the big game,” continued Withers. Plan activities like party games or door prize drawings to engage people and reduce alcohol consumption. Offer non-alcoholic drink options for designated drivers and those who are under age 21. Provide plenty of food to avoid guests drinking on an empty stomach and getting intoxicated more quickly. Be ready to step in if a guest has had too much to drink — offer to drive them home, arrange for a ride with a sober guest, call a taxi, or invite them to spend the night. The game-day program enhances teams’ existing designated driver programs with a pre-game MADD presence outside the stadiums, distribution of information cards inside, and an audio PSA. MADD and the NFL first announced their partnership in May 2010, and the game-day designated driver program has grown from two pilot teams to a total of 11 teams this season: Chicago Bears, Cincinnati Bengals, Buffalo Bills, Denver Broncos, Cleveland Browns, Arizona Cardinals, San Diego Chargers, Dallas Cowboys, Philadelphia Eagles, Oakland Raiders and Washington Redskins. For more information about MADD’s partnership with the NFL, visit www.madd.org/nfl. Founded by a mother whose daughter was killed by a drunk driver, Mothers Against Drunk Driving® (MADD) is the nation’s largest nonprofit working to protect families from drunk driving and underage drinking. With the help of those who want a safer future, MADD’s Campaign to Eliminate Drunk Driving® will end this danger on America’s roads. PowerTalk 21® is the national day for parents to talk with their kids about alcohol, using the proven strategies of Power of Parents® to reduce the risk of underage drinking. And as one of the largest victim services organizations in the U.S., MADD also supports drunk and drugged driving victims and survivors at no charge, serving one person every eight minutes through local MADD victim advocates and at 1-877-MADD-HELP. Learn more at www.madd.org or by calling 1-877-ASK-MADD. The above is an excerpt adapted from the article, “MADD Provides Tips for Safe Super Bowl Celebrations.” For more information, please visit www.madd.org/. Follow the manufacturer’s instructions and guidelines when using generators. Never connect generators to another power source such as power lines. The reverse flow of electricity or ‘backfeed’ can electrocute an unsuspecting utility worker. Alternative heaters need their space. Keep anything that can catch fire at least three feet away. Make sure your alternative heaters have ‘tip switches.’ These ‘tip switches’ are designed to automatically turn off the heater in the event they tip over. Never refill a space heater while it is operating or still hot. Refuel heaters only outdoors. Make sure wood stoves are properly installed, and at least three feet away from anything that can catch fire. Ensure they have the proper floor support and adequate ventilation. Use a glass or metal screen in front of your fireplace to prevent sparks from igniting nearby carpets, furniture or other items that can catch fire. Always use a flashlight – not a candle – for emergency lighting. Some smoke alarms may be dependent on your home’s electrical service and could be inoperative during a power outage. Check to see if your smoke alarm uses a back-up battery and install a new battery at least once a year. If there is a fire hydrant near your home, keep it clear of snow, ice and debris for easy access by the fire department. As you plan Super bowl festivities make sure to keep health and safety in mind during your celebrations. Hosting the party? Avoid a false start with fattening foods. Add healthy snacks to your menu instead of high fat foods, or go for the super bowl trophy by serving all healthy snacks. Eat healthy snacks before the celebration to prevent overindulging. Include fresh fruits and vegetables, such as apple halves or carrot sticks. There should be a variety in season. r serve fat-free or low-fat dips and dressings. Offer foods and beverages low in fat, calories, sugars, salt, and sodium. Serve foods and beverages that can be consumed by people with diabetes or on special diets. As you prepare game day meals and snacks, take steps to avoid serving recalled products and follow food safety guidelines to prevent illness. Visit the Food Safety website for information on product recalls. Follow the Four Rules of Food Safety: Clean, Separate, Cook, Chill. Don’t get a penalty for drinking and driving. Take steps to make sure you and other guests you celebrate with avoid driving under the influence of alcohol. Plan ahead. Always designate a non-drinking driver before any party or celebration begins. Don’t drink and drive or let others drink and drive. Be a helpful host by reminding your guests to designate a sober driver and offer alcohol-free beverages. Alcohol is common during sports celebrations, but be mindful that for pregnant women, consuming alcohol can cause babies to be born with fetal alcohol syndrome (FAS), a lifelong condition that causes physical and mental disabilities. The above is an excerpt adapted from the article, “Have a Safe and Healthy Super Bowl Celebration.” For more information, please visit www.cdc.gov/. Home fires are more prevalent in winter than in any other season. This is due in part to an increase in cooking and heating fires. Holiday decorations and winter storms that can interrupt electrical service and cause people to turn to alternative heating sources also contribute to the increased risk of fire in winter. Winter fires can be prevented! The following video can help you maintain a fire-safe home this winter season.